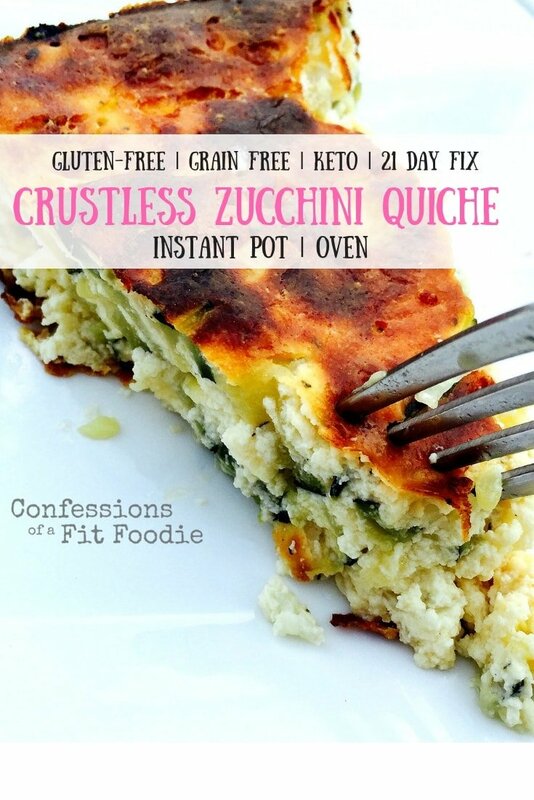 Crustless zucchini quiche is the perfect 21 Day Fix recipe for breakfast, brunch, lunch, or a light dinner! 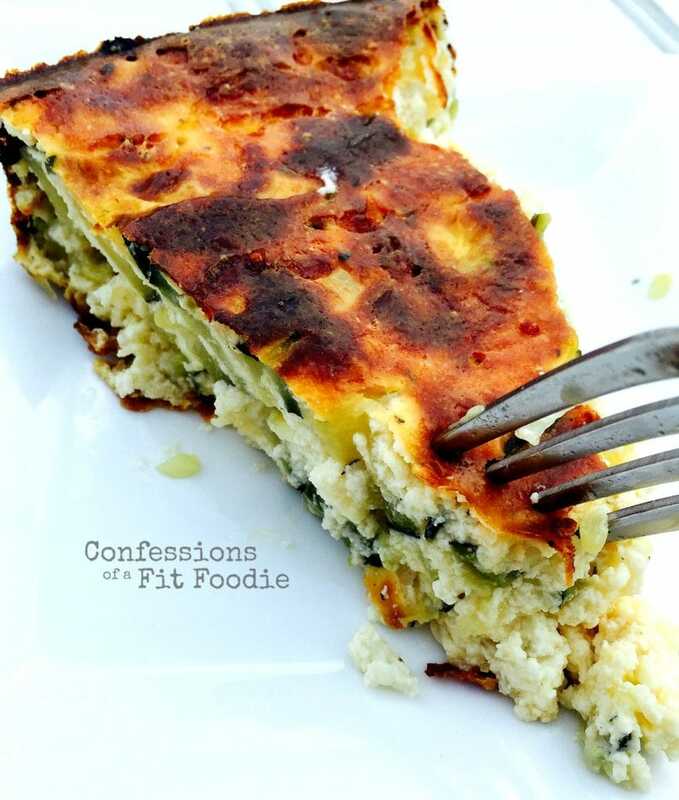 Fluffy eggs, 2 kinds of cheese, onion, and fresh garden zucchini are baked together in this healthy meal. This post contains affiliate links for products I’m obsessed with. 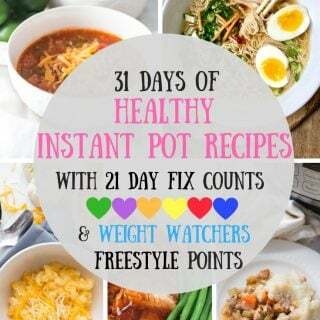 **New – Updated with Instant Pot directions! 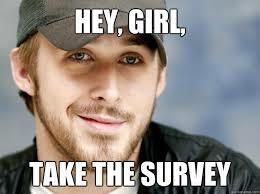 I’m getting great feedback on my First Reader Survey! Thanks so much to all who took the time to weigh in…if you haven’t had a chance, click on the pic for the link! Many thanks from me…and Ryan. 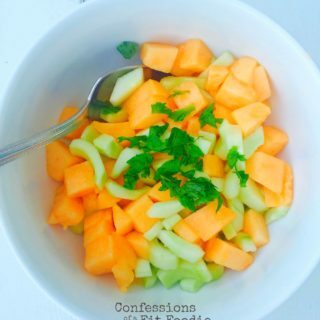 Anyway…it’s back to business and I have a great recipe for you to try. 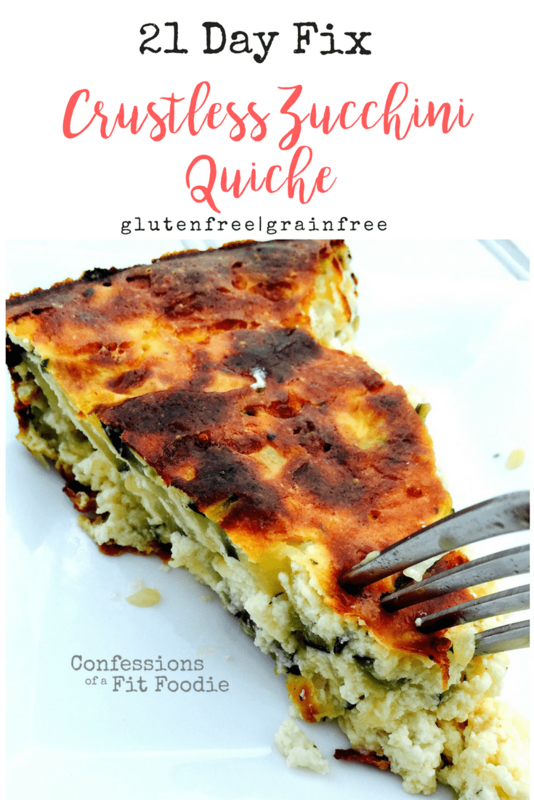 This crustless zucchini quiche would be a delicious addition to a weekend brunch, a fabulous make-ahead Meatless Monday dinner, or a yummy lunch to pack for the work week! My mom actually modified the recipe after reading a similar one on the back of a container of ricotta, and she made it for us the last time she was here. Honestly, it was SO darn delicious…I didn’t miss the crust one bit…and I would never lie about food :). The farm stands around here still have a ton of zucchini. Take advantage and pick some up today! Here’s the crustless zucchini quiche recipe. Enjoy! 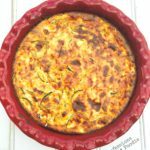 Crustless zucchini quiche is the perfect 21 Day Fix recipe for breakfast, brunch, lunch, or a light dinner! 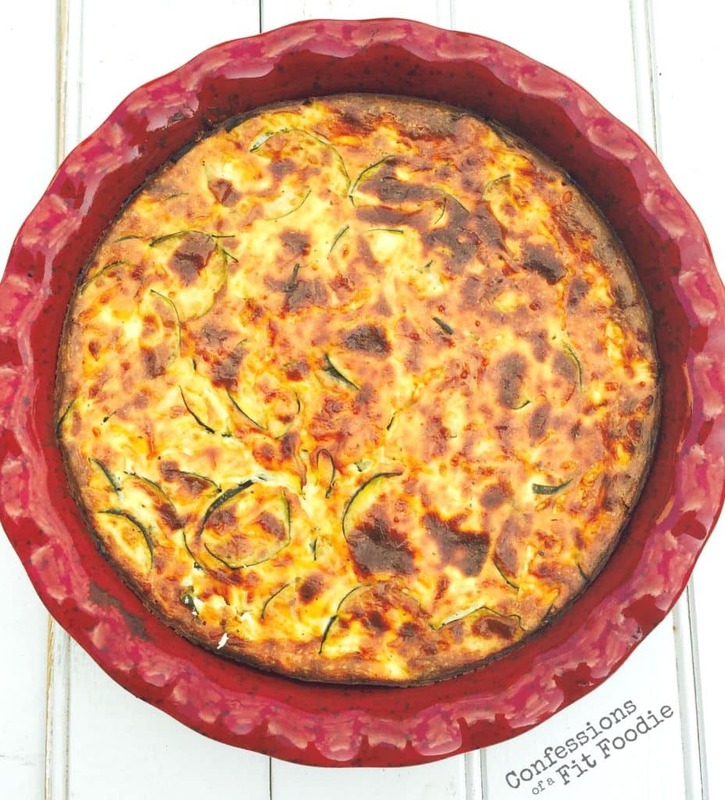 Fluffy eggs, 2 kinds of cheese, onion, and fresh garden zucchini are baked together in this healthy meal. Set Instant Pot to Sauté. When your pot is hot, add oil, butter or ghee and cook zucchini until it begins to soften. Add onions and cook for an additional 5 minutes or until tender. Stir in seasoning and pepper to zucchini mixture. 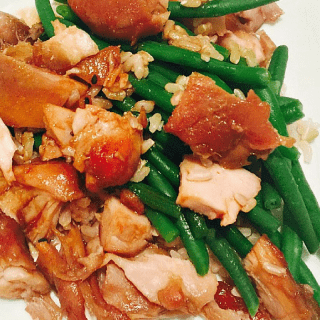 Turn Instant Pot off. In an Instant Pot safe casserole dish (affiliate link), beat eggs, then add in ricotta and mozzarella. Carefully fold in the zucchini and onions mixture. Rinse Instant Pot, then add in 1 cup of water and the Instant Pot trivet to the bottom of your pot. Carefully place the casserole dish on the trivet, or better yet, on a silicone sling (affiliate link) so you can lift it after cooktime. Lock lid and cook quiche for 30 minutes, then do a ten minute natural release, followed by a quick release. If desired, broil casserole on low to get a nice, crispy top before serving! Sautée zucchini in oil, butter or ghee until soft on low heat. Add onions and cook for an additional 10 minutes or until tender. Add seasoning and pepper to zucchini mixture. Beat eggs, then add in ricotta and mozzarella. Carefully fold in zucchini and onions. Spray a pie plate with cooking spray and fill with ingredients. Cook quiche until it sets – about 30 minutes, broiling for a few minutes at the end, if desired. What measurement is a small container of ricotta? Thanks! Hi Nancylynn, do you have an IP recipe for quiche? Also, can you swap out veggies fairly easily to use what you have? Thanks for all the awesome recipes! And I will try this one, too! <3. 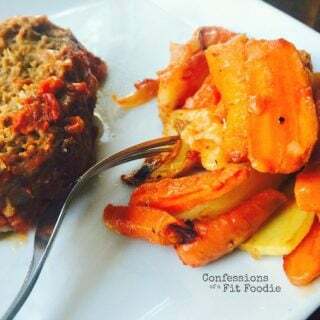 Oh - and yes - you can definitely swap out veggies!! It's totally customizable!! How much does a serving consist of? Made this tonight for the 1st time! Super easy and yummy! My husband had thirds! You are on a roll this week, Heather! This is also a great thing to make ahead for lunch! Hope your first week was great :). This looks really good!! I have a quick question, are you saying 1/2 red container or 1 out of 2? Hi! It’s a half red! And it is really good :). What size pie dish did you use? Does this last a full work week in the fridge? Would love to try for work lunches this week! I would say 3-4 days is ok! You can also freeze it in portions – it reheats great! I made this tonight and it was really good! Didn’t even miss the crust. I baked it longer than 30 minutes – took around 45 minutes or so since I like it a little brown on the edges and then broiled it on low to top it off. It was really good, highly recommend and will definitely be keeping this in the rotation. If you don’t have the part skim ricotta is there something I can use instead or is it worth the wait to go to the store and by it 🙂 It looks so amazing that I want it right now. I use ALL of your recipes. Beyond amazing. I used cottage cheese and it turned out great! I have substituted ricotta with greek yogurt with good results. It’s in the oven now…I can’t wait to try it. Hi! Do you think I could make it without the mozzarella cheese? I forgot to buy it and I really want to make it today. I do have grated Parmesan, could I use that instead? Thanks! This recipe has been my go to. I use this and variations of this with veggies I need to use up. Its a great breakfast, lunch, and dinner. This week I used mushrooms and Spinach, just drained the spinach before folding it in. Thank you so much! This single recipe has made my fix so easy. THANK YOU! Hi! I’m making this quiche right now and I’ve had to cook it way longer than 30 minutes. Is that normal? I have the oven at 350 and every time I take it out to check it, it still looks kind of jiggly. Do you have thoughts about that? You can increase your temp to 375! This is very forgiving, so don’t worry about overcooking. And you can brown it more by broiling on low at the end! I absolutely LOVE every one of your recipes!! I’ve just recently been introduced to your page by my daughter and I’m so happy with everything I’ve tried! They’re all simple, easy to follow, ingredients we all have and you put it together so well! Question on this one…can I use my cast iron skillet? Absolutely! And I am SO thrilled to hear that! I made this today! It was awesome, my daughter ate it for lunch AND LEFTOVERS FOR DINNER!! Ahhh!! That’s the BEST!! Thanks for taking the time to write, Donna! I love the update for the Instant Pot! I’ve been meaning to do it forever now! Enjoy!